If future historians are ever looking for evidence of the political schizophrenia and tribalism that engulfed American in the post-9/11 era, they could do much worse than White House Down, a film that presents itself as an argument for peace and reason but is built on a foundation of cartoonish, consequence-free movie violence and a sentiment of bloodthirsty revenge against public officials. But let’s get this out of the way first: White House Down is immensely enjoyable as long as you are willing to leave your ethics and intellect at the door. It’s silly in almost every way, from its hammy, quip-heavy dialogue to its mawkish patriotism, but it is at least serious about its silliness. The craft of an action movie is often taken for granted, and I’ve seen some incoherent ones in the last few months (Jack the Giant Slayer and A Good Day to Die Hard, I’m looking at you), but White House Down is an exceedingly well-made popcorn movie. Sure, it’s sometimes unclear whether you are supposed to be laughing with the film or at it, but if you’re laughing, do you really care why? John Cale (Channing Tatum) works security for the Speaker of the House (Richard Jenkins), but he longs to join the Secret Service and protect the president, mostly to impress his political junkie daughter. He brings her along on his job interview at the White House, where he is rejected for his past transgressions (he’s a maverick! ), but he soon gets a chance to prove he is right for the job. Domestic terrorists launch an incredibly well-orchestrated attack on the Capitol and the White House, and almost all of the president’s security is taken out, leaving only Cale to save both his country and his daughter. The details that director Roland Emmerich lays on top of this plot are decidedly liberal. The characters display a great reverence for government, like the Secret Service agent who tells a colleague that theirs is “the best job in the world” or Cale’s daughter, who feels adoration for the president that most normal 11-year-olds reserve for Justin Bieber. The opening sequence, in which the president requests that his helicopter fly low over the National Mall so he can appreciate the grandeur of Washington, is thick with reverence and plays like a bad episode of The West Wing. 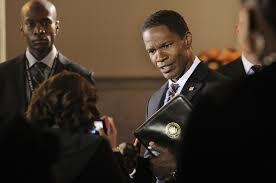 Further, President Sawyer (Jamie Foxx) is an undeniable stand-in for Obama: a former academic who loves basketball and is trying to quit smoking. But Emmerich makes him more of a liberal fantasy than a realistic depiction of Obama. As the film begins, he is working to create peace in the Middle East by passing the biggest aid package in history. Unlike our current leaders, he believes that the best way to prevent crime – even on a global scale – is to feed the hungry. It is a stark contrast to the approach put forth by our current government, especially the hawkish neo-conservative faction of the modern Republican party. But the best way to determine a film’s values may be to look at the motives of its villain. White House Down offers us a smorgasbord of motivations – indeed, each member of the domestic terrorist team has a different right-wing motive – but we eventually learn that the entire villainous plot has been cooked up by the “military-industrial complex” (so name-checked in the film), who aim to overthrow the president and launch a never-ending war with Iran, keeping their companies perpetually rich in government contracts. Depicting defense contractors as ruthless war mongers is not a brand new plot-device – the Iron Man movies have consistently painted arms manufacturers as the cause of war – but it is still encouraging, as it shows that their destructive influence on our foreign policy has become conventional wisdom. White House Down, after all, is a big summer movie that needs to make a lot of money to turn a profit; the filmmakers gain nothing from confronting the audience with ideas to which they are unaccustomed. So are we looking at a major milestone here – the first left-wing summer action blockbuster? Not so fast. The film’s purported commitment to promoting peaceful solutions and its thoughtful approach to foreign policy is thoroughly undercut by its violence. It is packed with wall-to-wall violence, but no blood – a trick that makes the mayhem seem consequence-free and allows the viewer to ignore its moral implications. But even worse, inherent in the plot is a gleeful anti-government message that caters to the worst impulses of the American electorate – a desire to put the hurt on the bureaucrats in charge. Here’s just one example: two terrorists enter a room where several cabinet officials are hiding. Bad Guy #1 pulls his weapon and shoots one official in the head. “You just killed the Secretary of Defense,” says Bad Guy #2. “He wasn’t doing a very good job,” says the first one. The line is played for laughs, but there’s catharsis in it, too. Underneath the quip beats the heart of an angry, disenfranchised American who wouldn’t mind a little violent revenge on the government – and there are certainly many of them out there. We can only hope that this film offers them an emotional release for their violent tendencies, instead of stoking the fire of their anger and resentment. So what are we looking at here? How do we rectify the liberal details and the great reverence for the government with these Tea Party tendencies? Does White House Down mean to build up the office of the presidency or tear it down to shreds? I’m not sure it even knows. But neither do we. In order to make his movie palatable to a mainstream audience, Emmerich has peppered his explosive action film with some pleasing rhetoric about peace. Take a look at your favorite cable news network, and you might see the same thing. Our government is run by public officials who claim to have learned the lessons of Vietnam, Iraq, and Afghanistan – in fact, our commander-in-chief was elected based largely on his opposition to the Iraq War – yet they all seem to favor getting involved in a similar imbroglio in Syria, taking sides in a potentially long civil war and arming rebels who have known ties to Islamic radicals. White House Down holds a funhouse mirror up to our silly, hypocritical government. It reflects a class of decision-makers who are trying to fool the electorate into thinking it wants peace, while laying the groundwork for more and more senseless destruction. And when that destruction occurs, they’ll hide the blood from us, too. White House Down didn’t fool me into thinking peace was more than a marketing campaign. But I had a great time, anyway, because, you know, it’s a movie. But let’s be clear that real life won’t wrap up so neatly at the end. Holy crap is this movie dumb as hell. But, I will admit that I had fun with it so I can’t complain too much. Good review. Thanks! I felt the same.